Glacier National Park, Montana: The Crown Jewel of the Continent. This phrase was coined for Glacier National Park's towering and sweeping beauty situated on the border of Montana and Alberta, Canada. Glacier Park was named for the many glaciers that spotted the mountainsides when the Great Northern Railway first set it's sights on the beautiful area. There are several notable glaciers, but perhaps the most famed of Glacier National Park, Montana's jewels is the Grinnell Glacier. Grinnell Glacier is nestled in the area surrounding the Many Glacier Lodge on the upper-east-side of the Glacier National Park's Garden Wall. Visitors to Glacier National Park and Grinnell Glacier would do well to book a reservation at the Many Glacier Lodge. The close proximity to Grinnell Glacier and the many other gorgeous features of Glacier National Park, Montana's east side makes the Many Glacier Lodge a natural choice. The Grinnell Glacier has seen bigger and brighter days, but that’s just part of it's long story. The beginning of the Grinnell Glacier dates back to the Pleistocene Epoch as long as 2 million years ago when glaciers and ice formed and coated the continent. The ice carved and cut the ridges and peaks we see today, relative to the other erosional forces also doing their part through the ages. 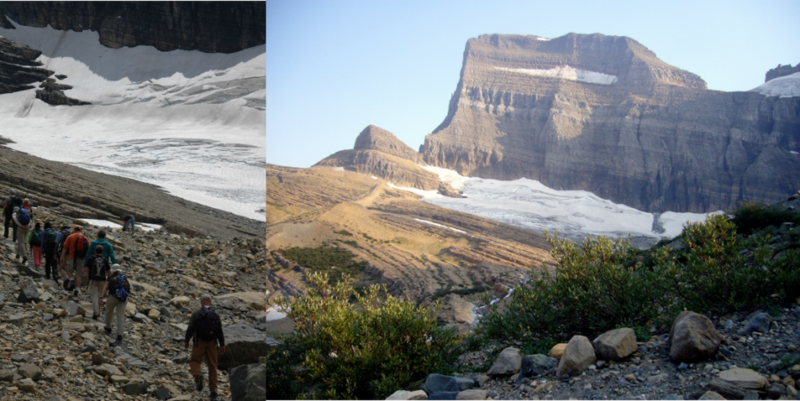 The remaining ice of the Grinnell Glacier is like the last of the ancestors who formed Glacier National Park. These ancestors have passed the story on by creating the cirques, hanging valleys and jagged peaks. The message will remain long after the ice makes it's way to the sea. Scientists estimate that time will come in approximately 20 years, give or take. That means there is still time to see the Grinnell Glacier and the other ancestral ice formations of Glacier National Park, Montana. Just around the corner from the Grinnell Glacier is the Many Glacier Lodge, named after these icy icons of Glacier National Park. The lodge itself is fitting of the national park style architecture with a huge great room featuring old growth logs for support. Guests love to sit on the wrap-around porch and gaze to the back (east) side of the Garden Wall. This becomes a time of nearly silent reflection and meditation for those seated in front of the breathtaking view. Inside the Many Glacier Lodge there are still more guests relaxing on several couches that also face the beautiful view of Mount Grinnell and Swiftcurrent Lake. The Many Glacier Lodge could be called the Crown Jewel of Glacier National Park Lodges as the ambiance and location are ideal. Take a hike to Grinnell Glacier from here or to many other notable hikes and vistas. Call National Park Reservations to make your Many Glacier Lodge reservations today. The days of the Grinnell Glacier are numbered but the spectacular creation left behind will be here to see for long to come. It is that creation that will forever tell the story of these glaciers; these sculptors of the Crown Jewels of the Continent. Endangered Species in our National Parks.